The Future Cities Canada Summit is being held in the Future Cities Centre at Evergreen Brick Works. This redeveloped historic kiln building has been transformed into a new dynamic year-round space where urban thought leaders and city builders can gather, co-create, test and prototype solutions for building inclusive low-carbon cities of the future. The redeveloped CRH Gallery in the Future Cities Centre. The revived space is the national hub for Future Cities Canada, and is a venue to showcase and celebrate the innovative ideas and solutions from across Canada and the world. Please note, there is limited parking on site. 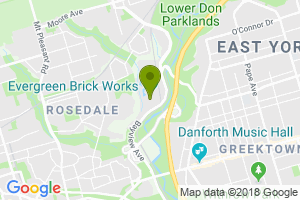 We recommend taking an alternative mode of transportation other than driving to get to Evergreen Brick Works, including the free shuttle that leaves Broadview Station or the 28 Bayview bus with the TTC. Please visit Evergreen's website for more information on getting to Evergreen Brick Works. Are you offering discounted tickets? We are offering a select number of bursaries to help cover costs associated with attending the Summit. To apply for a bursary, please fill out a bursary application by September 30th. For Future Cities Canada Summit sponsorship opportunities, please contact Darryl Chow at dchow@evergreen.ca. Can I volunteer at the Summit? All of our volunteer positions for the Summit are currently filled. If you are interested in other volunteer opportunities with Future Cities Canada or Evergreen, please visit Evergreen's website. I’m travelling to the Future Cities Canada Summit from out of town. Where should I stay?